Snake-arm robots are going places they had never been before, thanks to OCRobotics and KUKA Roboter. The OCRobotics snake-arm robot has just reached the first major milestone for assembly and inspection tasks within aircraft wings. 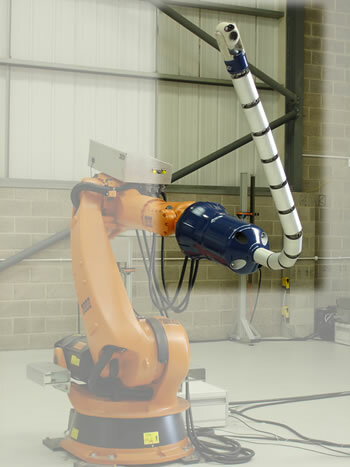 In a new configuration, the OCRobotics snake-arm robot is attached to the KUKA industrial robot, which uses the snake-arm robot as a tool. It is a flexible extension to the industrial robot. Initial tests show the arm is flexible enough to deliver the required tools to areas of the wing box that were previously inaccessible to automation. I turned by an effort, stumbled over the curate, and stopped at the scullery door. The tentacle was now some way, two yards or more, in the room, and twisting and turning, with queer sudden movements, this way and that. For a while I stood fascinated by that slow, fitful advance. Fortunately, OCRobotics has found a much more practical task for "steel tentacles" to perform. They have created a real-life robot with dexterity better than anything H.G. Wells' could have imagined. 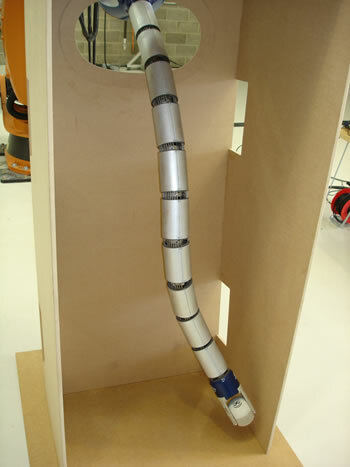 Update 07-Nov-2006: Here are some extra pictures of the snake-arm robot 'tentacle tip', supplied by OCRobotics. If you're interested, take a look at how KUKA has fun; learn about their Juke Bot Robot and the RoboCoaster G2 - Extreme Robot Roller Coaster. If you are interested in snake-like robots, be sure to check out the Snakebot Roundup!, which features six different robots, and the Anna Konda Robotic Fire Hose. Learn more about the snake-arm robot. Find out more about the OCRobotics snake-arm robot at their website.